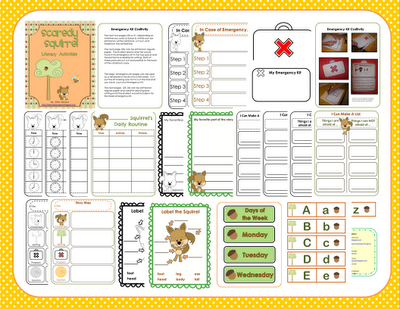 This week, my class started reading and writing with Scaredy Squirrel. This is one of my ALL TIME favorite book characters - probably because I can so easily relate to his insecurities and OCD! It is much safer to stay home, adhere to the schedule and be prepared for any possible emergency. Until, of course, one day everything goes wrong and Scaredy Squirrel is out in the Unknown! Are you beginning to see how kids (and teachers) can relate?! While the story itself is fantastic, the many different text features can lead to a million different writing lessons. There are lists, charts, diagrams, labels, maps, step by step directions - all with the dearest illustrations. At the beginning of first grade, I really am trying to get most of my little friends to just get anything down on paper during writing, much less a complete sentence! So, we usually start the year with lists, diagrams, and labels. These are much less intimidating that writing sentences and students can practice that ever-important skill of invented spelling on a smaller scale. And, of course, they all love to draw so labeling pictures is a given! 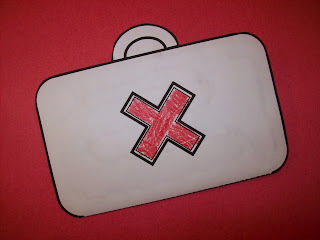 And we made our own Emergency Kits, just like Scaredy Squirrel! Translation: "My Emergency Kit has a balloon a flashlight and a ladder and a needle and a band aid." Next, we're going to write a few step by step instructions! 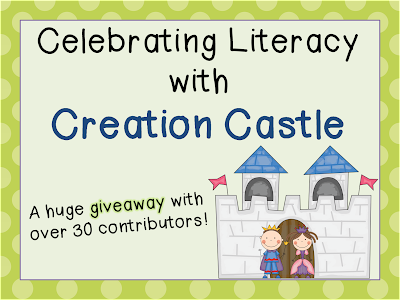 If you're interested in any of these activities, you can win a copy of my Scaredy Squirrel pack at Creation Castle! They are having a gigantic giveaway for every grade level! Thank you! I love how the kids debate which of Scaredy Squirrels fears are valid and which are "just crazy!"